Noises Off by Michael Frayn. 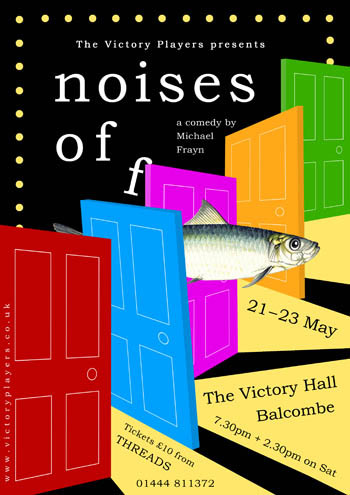 One friend told me that ‘Noises Off’ was almost certainly beyond the reach of a village am-dram company. The fact that the first night of the Victory Players production had me crying with laughter for most of the evening was a measure of the company’s success. Comedy depends on many things, but above all on timing. The discipline and precision of this production were astonishing. When one door closed on a situation, the next opened with unerring accuracy. The humour crescendoed as one scene built towards the next with painful intensity. If laughter is the best medicine, ‘Noises Off’ certainly saved the NHS a great deal that night. The cast were uniformly good. Joyce Baldwin’s fading soap star, Dotty Otley, entangled with at least two of the male characters, was a delight. Ronnie Whitehead co-directed excellently, and revelled in the role of Lloyd Dallas, the philandering director of the play within the play. Jon Hunt gave yet another tremendous Victory Players performance as Garry Lejeune, the seedy estate agent. Michael Mergler was gloriously gormless as Frederick Fellowes. The Clark family gave us two excellent juve leads, Molly spending most of the evening in her underclothes, as she tried to bed Garry, and Tom as a Stage Manager called upon to do everything, usually with no notice. Viv Clark was terrific as a woman trying to recapture the magic of romance with her tax-avoiding husband. Emily Holland was a suitably put-upon ASM, and Rodney Saunders was a magnificent elderly drunkard actor playing a jaded burglar. The structure of the play required a supremely competent stage crew, converting the set of the play into the backstage area, then back to the set again. John Randall (also the builder of the very impressive set), Anthony Philips and Mitch Collingbourne made light work of this, aided by Manuela Warburton, who also supervised the costumes with Isabel Gordon. Keith Major was the regular lighting genius. The whole company must have worked very hard to achieve this level of success. The result was one of those evenings you hope to have at the theatre, but rarely meet at am-dram level. ‘Noises Off’ is an extremely funny play, and the Victory Players production really did it justice. 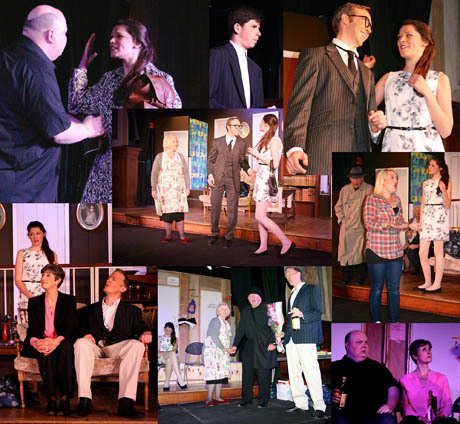 All the official photographs from Noises Off are available to view on The Victory Players Flickr page and also on The Victory Players facebook page. Please leave your comments about the show and remember to follow us. The full programme from Noises Off will be added to this page in PDF format shortly.